It is important to recognise that this list is restricted in scope and years of application. Deaths from the early years of the conflict or so-called “Troubles” beginning in 1966 are not included nor are deaths after 2001. The Army Council and GHQ Staff of the (Provisional) Irish Republican Army announced an official end to its military struggle on the 28th of July 2005 (the organisation came into being with the formation of a “Provisional” Army Council in December 1969 and was in a state of ceasefire from the 19th of July 1997). The general casualty lists for the (Provisional) Irish Republican Army, the British Occupation Forces, the British Terror Factions and the civilian population vary greatly according to sources, however the figures below are regarded as the closet in accuracy. 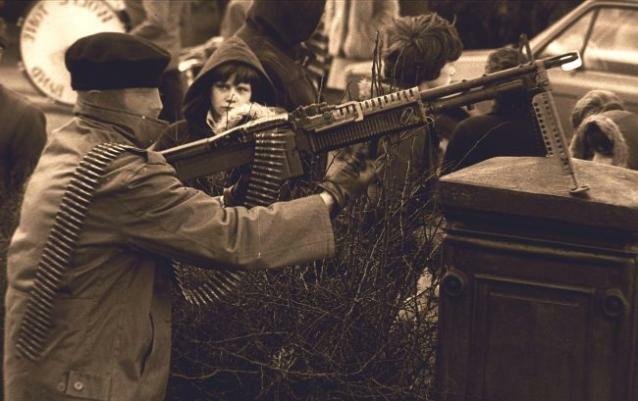 Percentage breakdown of fatalities caused by Irish Republican Forces/Insurgents: the Provisional Irish Republican Army (PIRA), Official Irish Republican Army (OIRA), Irish National Liberation Army (INLA), Irish Peoples Liberation Organisation (IPLO), etc. Percentage breakdown of fatalities caused by British Occupation Forces: British Armed Forces (BAF) incl. Ulster Defence Regiment (UDR), Royal Ulster Constabulary (RUC), etc. Percentage breakdown of fatalities caused by legal and illegal British Terror Factions: the Ulster Defence Association-Ulster Freedom Fighters (UDA-UFF), the Ulster Volunteer Forces (UVF), Red Hand Commando (RHC), Loyalist Volunteer Force (LVF), etc. In total some 100,000 people were wounded or injured during the course of the conflict in western Europe. Up to 20,000 people served as political prisoners or were held in enforced detention in Ireland, Britain and elsewhere.